Today in Masonic History John Bidwell passes away in 1900. John Bidwell was an American politician and pioneer. Bidwell was born in Chautauqua County, New York on August 5th, 1819. In 1829, he would move with his family to Erie, Pennsylvania. Finally the family would move to Ashtabula County, Ohio. At the age of 17, he would attend the Kingsville Academy. A short time later he would become it's principal. At the age of 21, Bidwell became one of the first emigrants to California. When Bidwell arrived in California, John Sutter hired him as his business manager. It was shortly after that gold was discovered at Sutter's Mill. Bidwell would capitalize on the California Gold Rush and would buy up large areas of land. Bidwell himself would find gold in the Feather River. He would create a productive claim there on the Feather River. Bidwell would attain the rank of major while fighting in the Mexican-American War. In 1849, Bidwell would serve in the California Senate. He would supervise the California census in 1850 and 1860. Also in 1860, he would be a delegate to the Democratic National Convention. After the American Civil War broke out, Bidwell would rejoin the military, this time serving as a brigadier general. for the California Militia. In 1864, Bidwell would be a delegate at the Republican National Convention. He would be elected as a Republican to the United States Congress from 1865 to 1867. In 1868, Bidwell would wed Annie Kennedy. In attendance at their wedding, President Andrew Johnson and future President Ulysses S. Grant. Once the couple would return to California the they would entertain a variety of guests at their mansion including President Rutherford B. Hayes and Susan B. Anthony. Annie was active in the Suffragette movement and the Prohibitionist movement. Bidwell would follow her lead and would campaign for both causes. 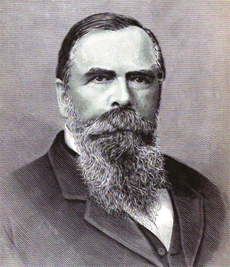 In 1892, Bidwell was the Prohibition Candidate for the President of the United States. He would achieve the highest number of votes for the Prohibition party in any national election, getting 2.3% of the vote. Bidwell would pass away on April 4th, 1900. Bidwell was a member of San Jose Lodge No. 10. Later he would affiliate with Chico Lodge No. 111. Bidwell's signature still appears in the by-laws of Chico Lodge. In 1867, Bidwell would send a letter to his, soon to be, wife Annie telling her that he felt that allegiance to the fraternity was "pointless".